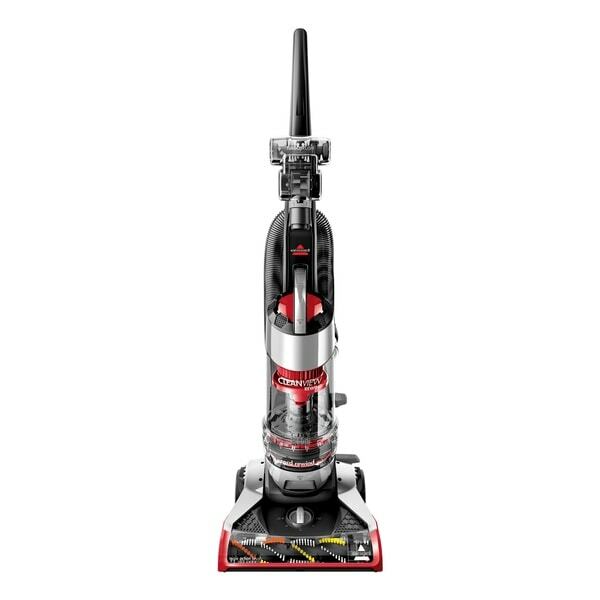 Great vacuum and the price is right! It is a simple design. Lightweight. The see through feature allows me to know when I have too much hair wrapped around the beater bar. Cord rewind was a must and it does not disappoint. Reminiscent of canister vacs when I was a child. Easy to empty. On the features that are wanting, the release button on the lower left is plastic and is very flimsy and the dust bin has some crevices that are easily gunked up. The hose extender is a single piece. The crevice tool cannot be used with the hose extender, which limits the reach some may desire. When I needed a new vacuum, I wanted a bagless, auto cord rewind and upright vacuum and the search brought up this Bissell. It had many good ratings. I'm happy with my decision. It has a powerful suction for deeper cleaning and I love the automatic cord rewind. Love my new Bissell. Its light, easy to use, and works so well. You can see the difference as you vacuum. Also, can see all the dirt and hair in the tunnel. Love the retractable cord also. This vacuum picked up a lot of dirt from my carpet on first use, I was so surprised. It's easy to clean and I'm looking forward to trying it on my hardwood floors. I recommend it for smaller spaces. Easy to assemble: and great easy way to clean. First time having a vacuum with no bags. What took me so long. Filters are able to clean. Loved it. I’m a huge fan of this vacuum. It suctions great and I love the automatic cord rewind feature. I don’t know why more vacuums don’t have them. It’s incredibly user friendly. The only con is that it is a tad heavy. I finally got a chance to open up my new vacuum. Let me start by saying I love this Bessell I never knew how much dirt is in a carpet. This vacuum machine pulled up so much stuff I couldn’t believe I had to dump it twice that’s how dirty this carpet wise. The best investment I’ve made so far. Great vacumn so easy to use lots if suction power..
Bought this to replace a worn out Hoover Windtunnel. So far, the machine works very well - extracts HUGE amounts of dust and fur from the rugs that were untouched by whle-house vac system and old Hoover unit. It is well made, but I really only expect these things to last a couple of years... We shall see. "I’m looking for a lightweight vacuum. How much does his vacuum weigh?" Affordable, Brand name trusted, high rating. This item is a great Christmas gift for my daughter who has a 5 bedroom home. I am sure she's going to love it...She had it on her wish list for Christmas.